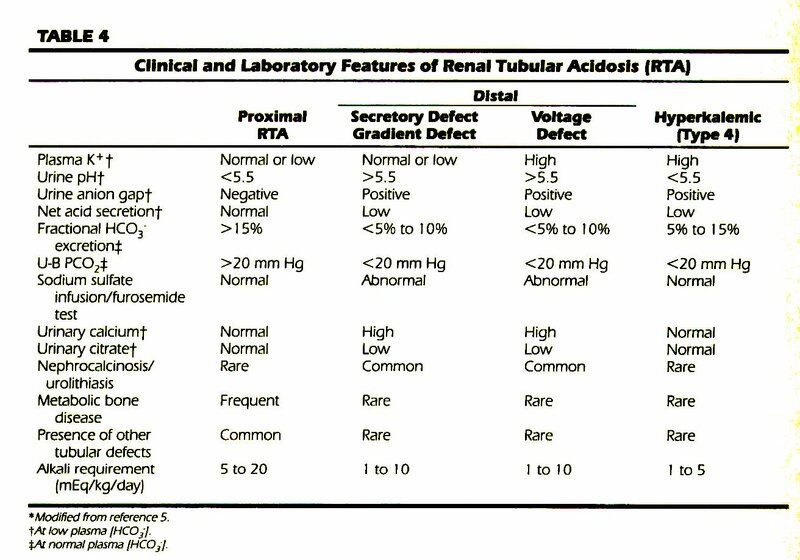 Renal tubular acidosis (RTA) is a diverse group of tubular transport disorders that involve defects in the reabsorption of bicarbonate or the excretion of hydrogen ions or both while the glomerular filtration rate remains relatively normal. The three primary types of RTA include: distal RTA (type 1 ), proximal RTA (type 2), and hyperkalemic RTA (type 4). This article reviews the pathophysiology and clinical manifestations of RTA syndromes, discusses their diagnostic evaluation, and describes their therapy and prognosis. Under normal conditions, healthy infants and children generate 1 to 3 mEq/kg/day acid mostly from dietary protein.1 That acid must be excreted by the kidneys to preserve acid-base homeostasis. To accomplish this, the kidneys reabsorb filtered bicarbonate primarily in the proximal tubule and excrete acid (as titratable acid and ammonium) primarily in the distal tubule.1'5 Normal renal acid-base handling is reviewed elsewhere.1"4. * A defect in a transporter involved in proximal tubular acidification. * Structural damage to the luminal membrane resulting in backflux of HCO3 ~ from cell into lumen. Etiology and Clinical Manifestations. Proximal RTA may occur in children as an isolated (sporadic or familial) condition or as a part of Fanconis syndrome, a generalized defect in proximal tubular function that is characterized by urinary loss of bicarbonate, glucose, phosphate, amino acids, and uric acid9 (Table 1). 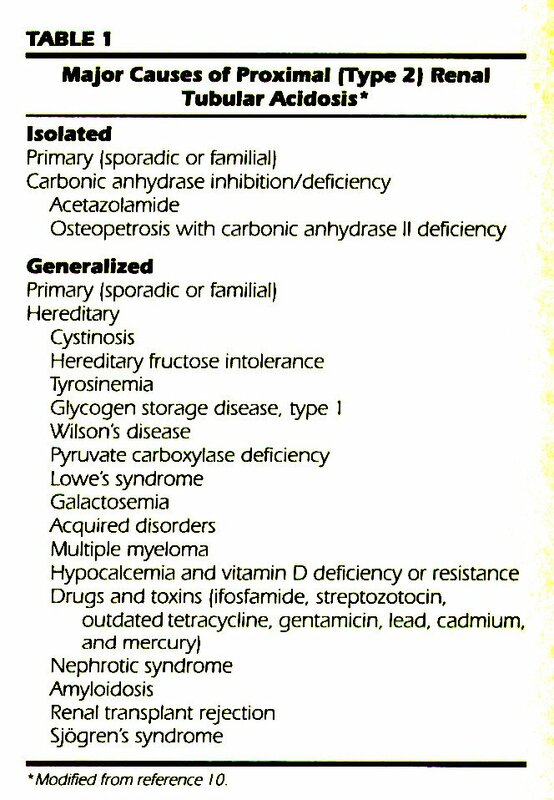 Fanconi's syndrome occurs in a variety of hereditary conditions or may be acquired in various disease states including immunemediated diseases and during administration of exogenous agents9,10 (Table 1). The most prominent clinical feature of proximal RTA is failure to thrive. Metabolic bone disease occurs only in patients with Fanconi's syndrome and is generally attributed to hypophosphatemia and impaired vitamin D metabolism.7,9 Hypercalciuria, nephrocele inosis, and nephrolithiasis typically are not observed. Children with proximal RTA may have symptoms related to untreated hypokalemia including polyuria, polydipsia, constipation, anorexia, vomiting, and muscle weakness. Rathophysio/ogy. Distal RTA is caused by impaired distal H+ secretion and is characterized by a failure to appropriately lower urine pH even in the presence of systemic acidosis.1,5 Urine pH usually remains above 6. The defective H+ secretion results in persistent bicarbonaturia (5% to 15% of filtered load in infants and children), reduced net acid secretion, and metabolic acidosis.1 The urinary anion gap is zero or positive indicating low urine ammonium concentration. * Secretory Defect. Secretory defect is a primary ("classical" distal RTA) or secondary disorder of the H + -ATPase pump of the a -intercalated cells in the collecting tubule. * Grathent Defect. This is a membrane permeability defect causing increased backleak of luminal H + observed, for example, in patients receiving amphotericin B. * Voltage-Dependent Defect. Voltage-dependent defect is the inability to generate an effective lumennegative transepithelial potential difference in the distal nephron. This defect is caused by factors that impair either reabsorption of Na+ in the distal tubule or distal delivery of Na + such as the diuretic amiloride (an inhibitor of Na+ channels) or severe volume depletion.1,11 A prominent feature of the voltagedependent defect is hyperkalemia as opposed to the hypokalemia usually observed in distal RTA. Untreated distal RTA is characterized by renal wasting of Na+ and K+. As in proximal RTA, the urinary K+ loss in distal RTA is due to extracellular fluid volume contraction and secondary hyperaldosteronism. Etiology and Clinical Manifestations. Distal RTA in children is most commonly a primary entity occurring sporadically or as a familial disorder (Table 2). It may occur as an autosomal dominant trait or as an autosomal recessive trait often associated with sensorineural hearing loss.12,13 The underlying mechanism in the hereditary forms is a secretory failure of the H+ pump. Distal RTA may occur in association with a variety of conditions (Table 2) including autoimmune disorders (secretory defect), tubulointerstitial nephropathies such as obstructive uropathy, sickle cell disease, transplant rejection, and systemic lupus erythematosus (voltage defect). It also can occur secondary to administration of drugs such as lithium, amiloride or triamterene (voltage defect), and amphotericin B or toluene (grathent defect). Incomplete RTA is a term used to describe adults and children who are unable to acidify urine maximally in response to NH4Cl load although they do not have systemic acidemia.1,7 The clinical importance of this condition, which can be transmitted as an autosomal dominant trait, is the presence of hypercalciuria, hypocitraturia, and nephrocalcinosis/ nephrolithiasis despite normal systemic pH. Two hereditary aldosterone resistance states (pseudohypoaldosteronism) have been described primarily in children. Type I pseudohypoaldosteronism involves a defect at the aldosterone receptor level and is associated with salt wasting, volume depletion, and hyponatremia.1 Plasma renin and aldosterone levels are increased. A second condition termed type II pseudohypoaldosteronism ("chloride shunt") is characterized by enhanced distal tubular Cl- transport that results in decreased lumen-negative transepithelial potential difference thereby diminishing H+ and K+ secretion.17 This syndrome is distinguished from voltage-dependent defect in type I RTA by the finding of appropriately acidic urine for the level of systemic acidosis. The enhanced Cl- and Na+ reabsorption leads to ECF volume expansion, hypertension, and decreased plasma renin and aldosterone levels. In RTA type 4, hypercalciuria and nephrocalcinosis usually are absent, and metabolic bone disease occurs only when renal failure is present. Manifestations of acidemia, hyperkalemia, and renal salt wasting may be prominent. In patients with hyperchloremic metabolic acidosis, when the excretion of Cl- exceeds that of Na+ and K + (negative urinary anion gap), it can be concluded that urinary NH4+ concentration is substantial and gastrointestinal loss of HCO3- or proximal RTA should be suspected. Conversely, when the excretion of Na+ and K+ exceeds that of Cl- (positive urinary anion gap), it can be assumed that urinary ammonium excretion is low and a distal acidification defect is most likely present.18,20 It should be noted that the urinary anion gap may significantly underestimate NH4+ secretion when large amounts of unmeasured anions such as ketoacids, salicylates, or penicillins are present in the urine. Net acid secretion (titra table acid + ammonium -HCO3-) is the gold standard of the analysis of distal acidification.18 Titratable acid is defined as the amount of NaOH required to raise urine pH to 7.4. The concentration of ammonium, the major urinary buffer, can be determined spectrophotometrically. Measurement of net acid secretion, however, rarely is used in clinical practice because urinary anion gap serves as a reliable estimate of ammonium excretion. Rates of HCO3- excretion are measured at different filtered loads OfHCO3- during sodium bicarbonate infusion. Plasma HCO3- concentration is raised gradually and fractional excretion of HCO3- (urine [HCO3 - I/plasma [HCO3 " ] X plasma [creatinine]/ urine !creatinine] X 100) is determined at different plasma HCO3- levels. This test helps to distinguish between proximal RTA that is characterized by FE HCO3- >15% and distal RTA that shows much lower levels of HCO5- excretion. Figure. Evaluation of hyperchloremic metabolic acidosis. Modified from reference 18. The purpose of the acid loading test is to induce metabolic acidosis and thereby evaluate renal acidification. NH4Cl (0.15 mg/kg) is given orally, and urine is collected for 4 to 8 hours until marked acidemia develops. The finding of a urine pH >5.5 despite significant acidemia (plasma [HCO3 -]< 15) supports the diagnosis of distal RTA. This test uses urine PCO2 as an index for distal acidification based on the principle that secretion of protons into an alkaline urine containing bicarbonate results in formation of carbonic acid (H2CO3), which dissociates to H2O and CO2. Because carbonic anhydrase is not present in the distal tubular lumen, the dehydration of H2CO3 occurs slowly. Much of the CO2 is generated and retained in the medulla and the lower urinary tract where its diffusion from urine to blood is not favored.21 In this test, urine-blood PCO2 (U-B PCO2) is determined after urine pH and bicarbonate concentrations are markedly increased by administration of HCO3-.18,21 In normal subjects, urine IHCO3-I >80 mEq/L and a urine pH >7.6 result in U-B PCO2>20 mm Hg. A value <20 mm Hg implies reduced rate of distal H+ secretion. The capacity of distal H+ secretion can be assessed by infusion of sodium sulfate that maximizes the lumen negative transepithelial potential difference in the distal tubule.18 This effect is achieved because Na+ is reabsorbed, and sulfate, a poorly absorbed anion, is retained in the lumen. A normal response to the infusion is an increase in net acid excretion, urine pH <5.2, and an increase in K+ excretion. A failure to appropriately respond implies either a secretory or a voltage-dependent defect. The same principle underlies the furosemide test. Normally, intravenous or oral administration of furosemide, an inhibitor of the Na +/K+ /2 Cl- pump in the loop of Henle, increases Na+ delivery to the distal nephron thereby augmenting the Na+ reabsorptioninduced, voltage-mediated effect on H+ and K+ secretion.1,18 An abnormal furosemide test suggests a distal acidification (secretory or voltage-dependent) defect. The clinical and laboratory features of the RTA syndromes are summarized in Table 4. The evaluation of a child with hyperchloremic metabolic acidosis is usually straightforward, and several simple clinical and laboratory data are often enough to define the cause of the acidosis and to localize the tubular defect. 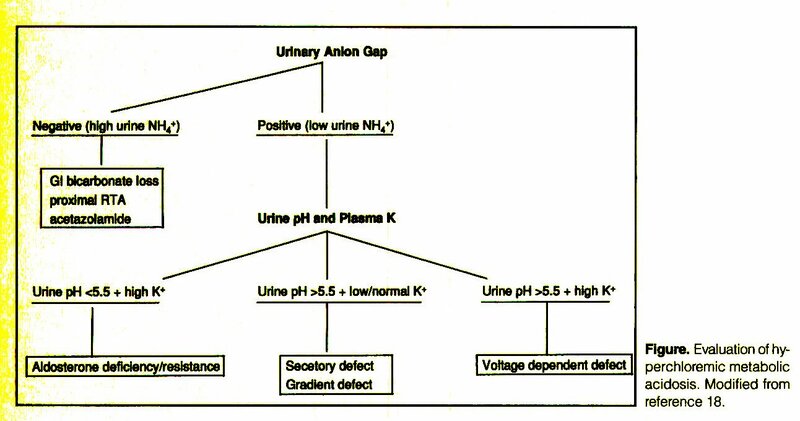 A stepwise approach using the urinary anion gap, urine pH, and plasma K+ is helpful (Figure). Other tests are used when indicated to support the presumed diagnosis of a specific RTA type or to investigate questionable cases. First, the urinary anion gap serves to make a distinction between conditions associated with abnormal distal acidification that are characterized by a positive urinary anion gap (low NH4. + production) and conditions with normal distal acidification in which a negative urinary anion gap (normal NH4+ production) is found. The latter finding indicates the presence of gastrointestinal or renal losses of HCO3 - . If nonrenal causes are excluded and acetazolamide has not been used, definite diagnosis of proximal RTA can be established by the demonstration of low urine pH during acidemia, determination of FE HCO3- (HCO3- titration testing), and the presence of normal U-B PCO21,5 (Table 4). If proximal RTA is diagnosed, the patient should be investigated for the potential presence of other proximal tubular defects. When urinary anion gap is positive, urine pH and plasma K+ will help to define the nature of the distal acidification defect. Normo/hypokalemia coupled with urine pH >5.5 during spontaneous acidosis strongly suggests the presence of a secretory ("classical") or a grathent defect. The diagnosis can be established by the demonstration of an inability to maximally acidify the urine either after NH4Cl loading or after sodium sulfate infusion/furosemide administration as well as by the finding of U-B PCO2 <20 mm Hg after alkali loading5,18 (Table 4). The evaluation of distal RTA should include examination of urinary calcium and citrate levels as well as renal ultrasound to investigate for the presence of nephrocalcinosis. The combination of hyperkalemia and urine pH>5.5 during spontaneous (or NH4Cl "-induced) acidemia suggests the presence of a voltage-dependent defect. Tubulointerstitial nephropathy such as obstructive uropathy should be excluded. Hyperkalemia coupled with urine pH<5.5 during acidosis suggests hyperkalemic (type 4) RTA. Glomerular filtration rate may be reduced. The child with type 4 RTA should be carefully evaluated for the presence of an underlying renal disease, in particular structural urinary tract abnormality. Plasma renin and aldosterone levels should be examined to distinguish between aldosterone deficiency and aldosterone resistance states. Children with nephrocalcinosis/nephrolithiasis of unknown cause should be evaluated for the possibility of incomplete distal RTA. The findings of urine pH>5.5 after acid loading and abnormal U-B PCO2 (<20 mm Hg) after alkali loading will identify these patients. The goals of RTA therapy are to improve growth, to neutralize metabolic bone disease, to prevent nephrocalcinosis/nephrolithiasis, and to prevent progressive renal insufficiency. This is achieved by controlling the underlying disease if present, avoiding precipitating factors, correcting electrolyte abnormalities, correcting mineral imbalance, and instituting alkali therapy. Children with proximal RTA require large doses of alkali, up to 20 mEq/kg/day. Hypokalemia should be corrected by using KCl supplements or by giving a large fraction of the alkali requirement as potassium bicarbonate or potassium citrate. Restriction of dietary salt is required if large doses of NaHCO3 are used. 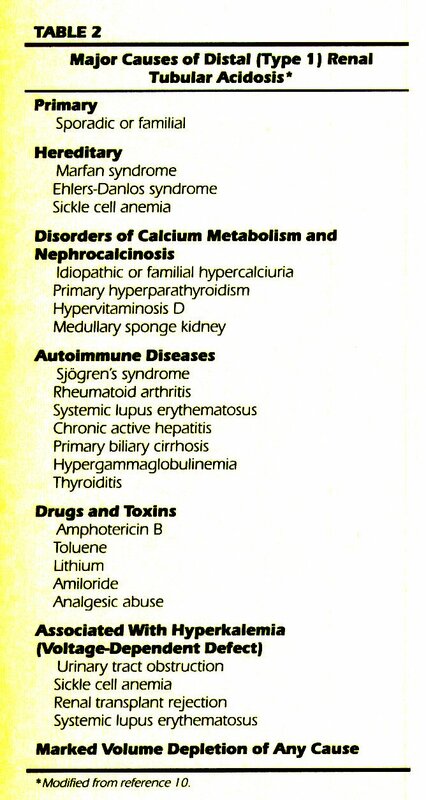 Vitamin D supplements are used in cases of Fanconi's syndrome when indicated. In infants with isolated type 1 or type 2 RTA, growth velocity increases dramatically within weeks of initiating alkali therapy, and normal stature is achieved within several months. Older children require longer therapy to achieve normal height. While isolated proximal RTA may resolve over the first decade of life, isolated distal RTA is a life-long disease that requires life-long therapy and monitoring mainly to prevent nephrocalcinosis.13 If treatment is initiated prior to the development of nephrocalcinosis, the prognosis is excellent. In patients with type 4 RTA who have moderate renal insufficiency, treatment of hyperkalemia by restricting K+ intake as well as by the use of furosemide can ameliorate the metabolic acidosis.1 Low doses OfNaHCO3- (1 to 2 mEq/kg/day) may be sufficient to correct the acidemia. Mineralocorticoid therapy is indicated in patients with aldosterone deficiency. Renal tubular acidosis type 4 secondary to urinary tract obstruction usually resolves within 12 months of correction. 1 . Portale AA. Renal tubular acidosis. In: Holliday MA, Barrati TM, Avner EU eds. Pediatric Nephrology. Baltimore, Md: Williams & Wilkiru; 1994:640-662. 2. Alpern RJ, Stone DK, Rector FC Jr. Renal acidification mechanisms. In: Brenner BM. Rector FC ir, eds. TAe Kidney. Philadelphia. Ri: WB Saunders Co; 1991:3 IS379. 3. Cogan MG, Quan AH. Renal acidification: integrated tubular responses. In: Windhager EE, ed. Renal Physiology New \brli, NY: Oxford University Press; 1992:969-1016. 4. Anwison PS. Mechanisms erf active H4 secretion in the proximal tubule. Am J Physiol. 1983;245:F647-659. 5. Rodriguez-Soriano J, Vallo A. Renal tubular acidosis. IVaW Nephrol. 1 990:4:268275. 6. Davidman M, Schmit2 V. Renal tubular acidosis: a pathophysiologic approach. Hasp PraaiOff Ed). 1988:77-%. 7. Rothstein M, Obialo C, Hruska KA. 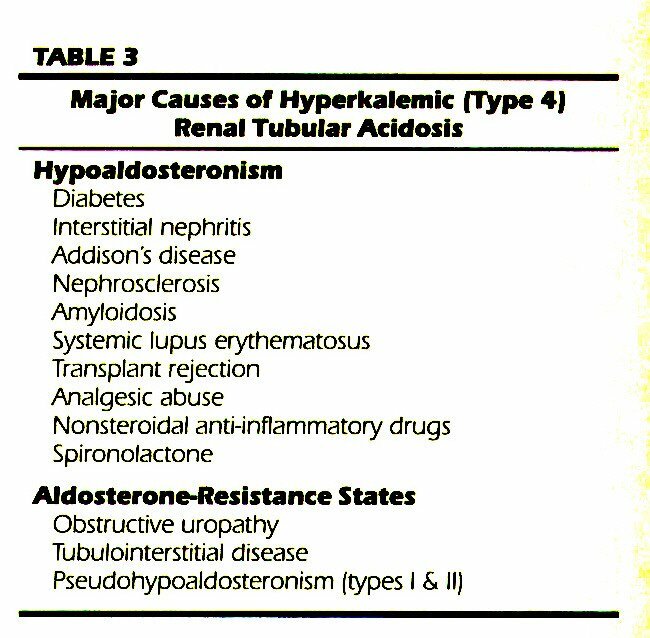 Renal tubular acidosis. Endocrino! Metah Clin Norm Am. 1990:19:869-887. 8. Sly VCS, Why» MB, Sondaran) V, « al Carbonic anhydrase Il deficiency in 12 families with the autosomal recessive syndrome of osteopetrosis with renal tubular acidosis and cerebral calcification. N Engl / Med. 1985:31 3:1 39-145. 9. Bergeron M, Gougoux A. The renal Fanconi syndrome. In: Scriver CR, Beaudet AL, Sly WS. Valle ß eds. The Metabolic Basii of inherited Disease. New York: McGraw-Hill; 1989:2569-2580. 10. Rose BD. Metabolic acidosis. In: Rose BD ed. Clinical Physiology of Ada-Base and Electrolyte Disorders. New York, NY: McGraw-Hill; 1994:540-603. 11. Izraeli S, Rachmel A, Frishberg Y, et al. Transient renal acidification defect during acute infantile diarrhea: the role of urinary sodium. I Miao. 1990;) 17:7 1 1 -716. 1 2. Dunger DB, Brenton DP, Cain AR. Renal tubular acidosis and nerve deafness. Arch Dis Child. 1980;55:221-225. 13. Caldas A, Broyer M, Dechaux M, Kleinknecht C Primary distal tubular acidosis in childhood: clinical srudy and long-term follow-up of 28 patients. J Pedum. 1992:121:233-241. 14- Brenner RJ, Spring DB, Sebastian A, et al. Incidence of radiographically evident hone disease, nephrocalcinosis, and nephrolithiasis in various types of renal tubular acidosis. N Engl; Med. 1982;307:217-221. 16. Rodriguez-Soriano J, Vallo A. Renal tubular hyperkalemia in childhood. Pediatr Nephro!. 1988;2:498-509. 17. Schambelan M, Sebastian A, Rector FR Jr. Mincralocorticoid-resistani renal hyperkalemia without salt wasting (type Il pseudohypoaldosteronism). Role of increased renal chloride reabsorption. Kidney Int. 1981;19:716-727. 18. Lash JP, Arruda JAL. Laboratory evaluation of renal tubular acidosis. Clin Lob Med. 1993;13:117-129. 19. Halperin ML. Richardson RMA, Bear RA, Magnet PO. Kamel K. Erhier J. Urine ammonium; the key to the diagnosis of distal renal tubular acidosis. Nephron. 1988;50:1-4. 20. Battle DC, Hizon M, Cohen E, Gutterman C, Gupta R. The use of the urinary anion gap in the diagnosis of hyperchloremic acidosis. N Eng! J Med. i 988; 318:594599. 21 . Dubose TD Jr. Hydrogen ion secretion hy the collecting duct is a determinant of the urine to blood PCOj grathent in alkaline urine. J CIm Invest. 1982;69: 145- 1 56.